Fair warning: the more time you spend here in the hallowed halls of The Pie Academy, the more pear pie recipes you are going to see. And that’s a promise I look forward to keeping. In certain ways, I like pears and – by extension – pear pies even more than I do apples and apple pie. This may sound like heresy coming from the fellow who actually wrote the book on apple pie, but it’s true: I love their softness of flesh, their floral bouquet, and their juiciness. Even the shape is beautiful. What’s not to like? I’ll often mix pears with apples in a pie, but an even bolder approach is to use all pears, the way I do here. 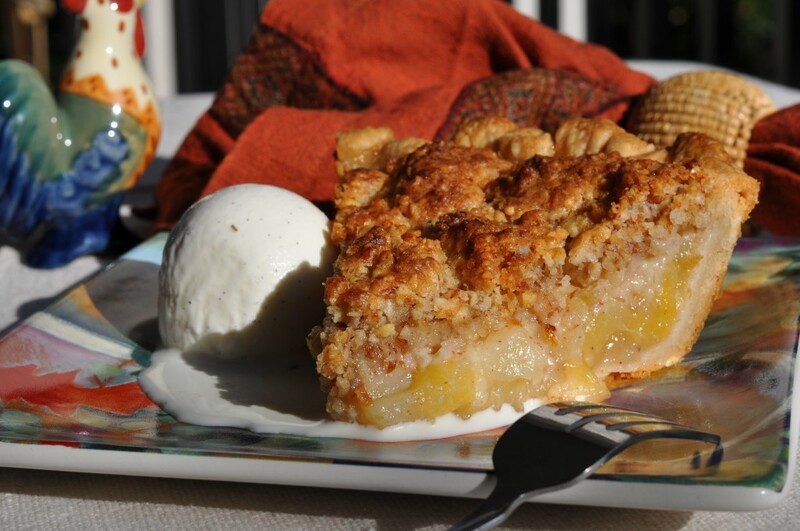 As with apple pie, a bit of sugar, lemon juice and thickener are required and – beyond that – the matter of what to top it off with: a top crust or crumb crust? The answer here is neither. I like both, but I prefer this option even more. For lack of a more precise term, I call the topping on this pear pie Almond Coffeecake and I’d be quite surprised if – once you make it – you thought the term was inaccurate. It’s dense, almond-crunchy, and buttery. But cake-like too, thanks to the egg and baking powder. You’ll be a hero. And your guests won’t soon forget the bold baker who served pear pie and vanilla ice cream at noon. PASTRY NOTE: Use any favorite pie dough recipe you like for the shell. My own preference is for the GOOD BASIC PIE DOUGH. On a sheet of lightly floured wax paper, roll the pastry into a 13" circle with a floured rolling pin. Invert the pastry over a 9 1/2" deep-dish pie pan, center, and peel off the paper. Tuck the pastry into the pan, without stretching it, and sculpt the edge into an upstanding rim. Place in the freezer for 15 minutes. Combine the pears, 1/3 cup sugar, lemon juice, and lemon zest in a large bowl. Set aside for 10 minutes. Preheat the oven to 400°. Combine the remaining 2 tablespoons sugar, cornstarch, and spice in a small bowl, then stir into the fruit. Scrape the filling into the chilled pie shell. Place the pie on the center oven rack and bake for 30 minutes. Reduce the heat to 375° and bake 10 minutes more. Meanwhile, as the pie bakes make the topping. Put the almonds, sugar, flour, coconut, baking powder, and salt in a food processor and pulse until the nuts are very finely chopped. Scatter the butter over the top and pulse until it is well incorporated and the mixture is crumbly. Whisk the egg, vanilla, and almond extract (if using) together in a small bowl. Add to the processor and pulse again, just until the mixture starts to bunch up around the blade. Spread the mixture on a plate and refrigerate until needed. After the pie has baked for a total of 40 minutes, slide it out and - using your finger - crumble and spread the mixture more or less evenly over the fruit. Don't worry if it looks lumpy, because it will. It will settle somewhat as the pie bakes. Slide the pie back in and continue to bake until the topping is a rich golden color and has baked through, about 20 to 25 minutes. 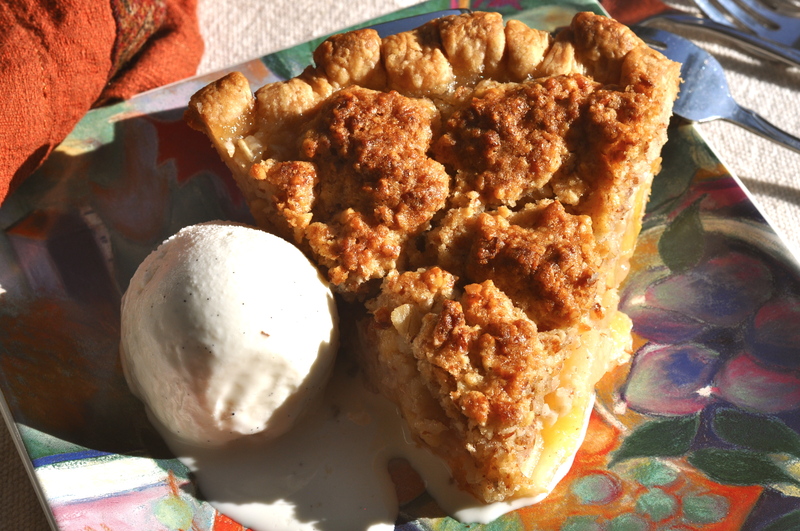 Transfer the pie to a cooling rack and cool for at least 1 to 2 hours before slicing and serving. I like this one best served slightly warm or at room temperature. Makes 8 to 10 servings.